GOOD NEWS! From 18 September to 1 October, complete more rides to enter the “Spin-to-Win” lucky draw! Simply complete more rides and stand a chance to win attractive prizes! Step 1: Complete the minimum jobs required as shown on the App. Step 2: Press on the middle Red button to begin your spin. Step 4: Look for your prizes in your notifications box. 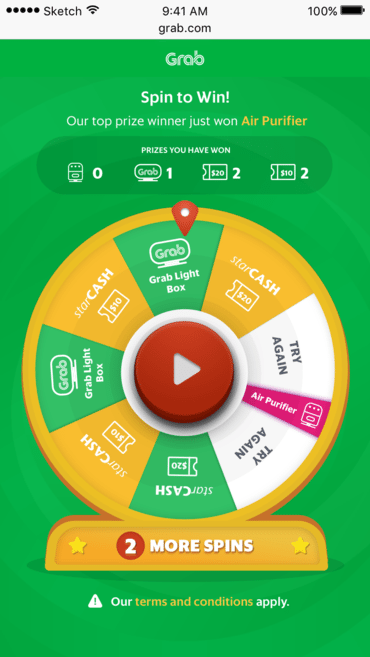 “Spin to Win” campaign is organised by GrabTaxi Pte. Ltd. (“Grab” or “the Organiser”) and is open to selected GrabTaxi drivers (“Eligible Partners” or “Partner”). By entering the Spin to Win campaign, you represent you have read, understood, and agreed to be bound by these terms and conditions of entry and you acknowledge and agree to be legally bound by these terms and conditions and decisions of the Organiser without limitation or qualification. You further agree that all decisions of the Organiser shall be final and conclusive. Spin to Win campaign will run from 18 September 2017 to 1 October 2017; Grab reserves the sole and absolute right to alter or end the Spin to Win campaign at any time, without giving prior notice or compensation in cash or in kind. Each Eligible Partners may enter the Spin to Win campaign with up to 14 chances, subject to the minimum requirements to qualify for a spin. Each Partner will be given a chance to spin given that the minimum number of completed trips requirement is met. 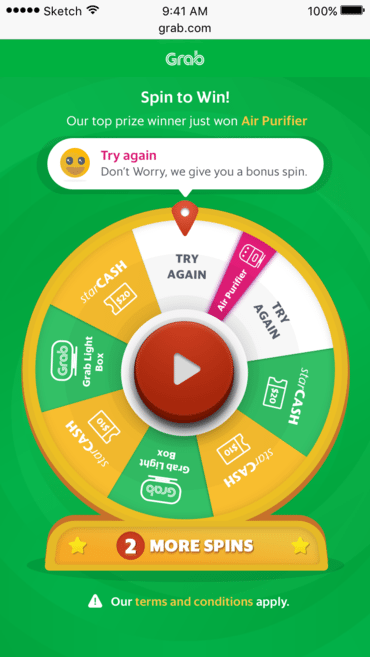 Participants must download the latest version of the Grab mobile application, for Android version 5.22 or newer, and for iOS version 1.9 or newer, in order to participate in the Spin to Win campaign. Details on the redemption dates & time will be sent after the end of the campaign by 3 October 2017 . Any prizes not redeemed after the prize collection period (last date of collection is 14 October 2017) will be forfeited. Grab reserves the sole and absolute right to disqualify any participant or reject participant(s) deemed ineligible for the Spin to Win campaign (whether due to a breach of these Terms & Conditions or due to a participant having engaged in conduct that the Organiser considers inappropriate or unacceptable). To be eligible for the prizes, Eligible Partners must not be suspended, or terminated from the Grab platform from 18 September 2017 onwards. Grab reserves the sole and absolute right to withdraw, amend and/or alter any part or the whole terms and conditions of this Spin to Win campaign at any time without giving any prior notice to the participants. Grab’s decisions in any matter in relation shall be final and conclusive. Any request for appeal and review shall not be entertained. 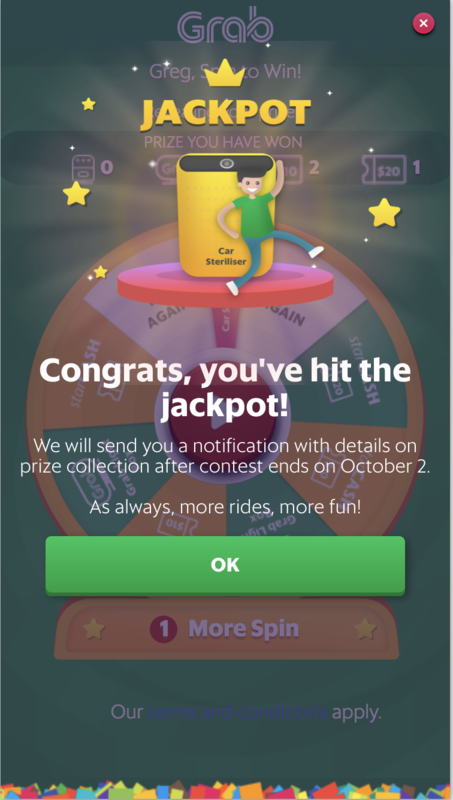 By participating in the Spin to Win campaign, each participant consents to Grab collecting and using data through the Grab driver application and any other mobile application required to be used by the participants during the Spin to Win campaign, for the purposes of Grab’s administering the campaign.